The sCare Foundation announced this week that Freddy Krueger himself, horror icon Robert Englund will be honored as the 2013 Humanitarian of the Year at this year’s 3rd annual Halloween Benefit in Los Angeles this October. 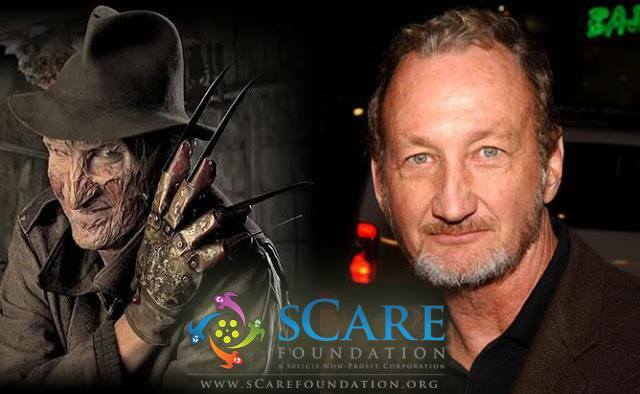 The sCare Foundation is proud to announce cinema icon and philanthropist Robert Englund will be celebrated as our ‘Humanitarian of the Year’ at the 2013 sCare Foundation Halloween Benefit Event, taking place in Los Angeles on October 27th. Englund is a veteran of over 150 film and television shows, and is perhaps best known as razor gloved ‘Freddy Krueger’ in the Nightmare On Elm Street films. More details on the event, including tickets and other guest announcements, coming soon! You can learn more about the sCare Foundation at www.scarefoundation.org. Jamie Lee Curtis was the first to receive the Foundation’s Humanitarian of the Year award at the first benefit gala in 2011, followed by Kyle Richards (pictured below) in 2012.